Whether you need to convert between scales, time your trains or maintain an inventory of your rolling stock there’s an Android App to help you. 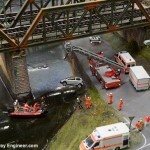 Here are 6 free apps you need on your phone for model railways. I must admit when a friend first recommended this I had doubts. I’ve got several magnifying glasses in my toolbox, what use could having one on my phone be? Having had it for a while now however I’m surprised how often I do use it and how much more useful it is over a traditional magnifying glass. For starters, there’s the convenience factor. 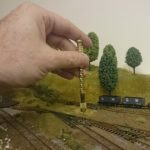 If like me you visit shows, boot sales and the like and often end up buying trains being able to check small details on them before purchasing is very helpful. But while I may occasionally carry a jewellers loupe I always have my phone, and with this app I’m always able to check small details on prospective purchases. But what use could it be at the workbench when I have easy access to my normal magnifying glasses. Sure it’s auto-focus magnification is useful and the ability to use the phone camera flash as a light is handy but what really elevates this is the digital effects feature. At the tap of a button the object being viewed can be seen in monochrome or the brightness increased. It sounds simple but this is surprisingly useful. Viewing in mono takes away a lot of distraction when trying to see a particular element up close and changing brightness often brings out details I’d otherwise miss. Also, being able to freeze the subject matter and then compare to reference sources away from the workbench saves books from getting dirty and messed up. It’s a small app, but one that has proved useful time and time again in my model making. From Woodland Scenics, Model Scaler (pictured above, top) makes it quick and easy to calculate measurements to scale. Sure it’s easy to work these out but Model Scaler makes it just that bit easier and more convenient. The only slight downside of the app is that OO isn’t included in the default scales for conversion but it can be added easily enough. 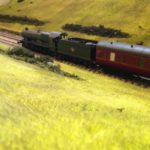 As your model railways grows you might want to catalogue your train collection for insurance or just general organisational purposes. Model Inventory is just the ticket. Locomotives, rolling stock, structures, scenery and accessories can all be recorded with purchase date, price, notes and even photos. Usefully, the inventory can be exported for backup or used in a spreadsheet. 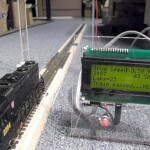 Fast Clock shows time passing at an accelerated rate, as it’ll be on the scaled down world of the trains, and is ideal for running accurate operations and timetables. Personally I prefer building model railways over operating them but if operations are your thing this is a perfect little app. Ignore the apparent typo in the name, Handy Tools for DYI is a useful combination of measuring tool and protractor for angles and small distances. It’s dead handy for building construction where precise angles and sizes are required but it also has a spirit level for track laying and baseboard construction. 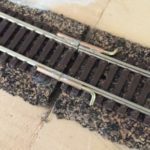 MRE Extra: For traditional tools, see Baseboard Construction Tools and Essential Tools For Model Railways. If you’re moving up from a train set to a model railway and struggling with the electrics or maintain a reasonable sized layout this collection of electrical reference guides and calculators has to be on your phone or tablet. 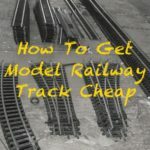 Although aimed at general electrics there’s plenty here that railway modellers will find useful from reference guides for decoding resistor and inductor colours to voltage drop and LED resistance calculators. What apps do you use alongside your railways? Share yours in a comment below.